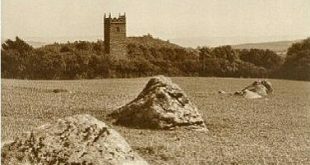 If the early antiquarians are to be believed then Dartmoor was a land of sacred oak groves, druidical temples, and places of deep mystery. Many of the stranger physical features of the moor have been said to have been the work of these ancient priests. Today, vestiges of their presence exist in place-names such as the Druid’s Chair, Druid’s Well, Druid’s Altar, Druid’s Stone, Druid Mine, Drewsteignton, Druid, and the Druidical Temple. Probably the place most associated with Druid folklore is Wistman’s Wood, some people consider that the name derived from ‘Wood of the Wisemen’, referring directly to the Druids. Today it is still not hard to see why the dense wood of dwarf, gnarled, oak trees should have spawned legends of ancient pagan rituals amongst the early dwellers of the moor. Indeed, is not the wood overlooked by Beardown or the ‘Hill of Bards’, are not the surrounding slopes scattered with the remains of early settlements? Ok, sadly it’s time to dismantle the legends, starting with the place-name evidence. There are two settlements on the moor which on the face of it allude to the druids, the village of Drewsteignton, Higher, Middle and Lower Drewston and a small hamlet called Druid. In the Domesday Book of 1086, Drewsteignton was noted as Taintona or ‘Farm on the river Teign’. It was not until 1210 that the Drogo or Drew element was mentioned in connexion with the settlement, clearly this was well after the days of the druids. The Drewstons first appear in 1281 when the name was Thurwardeston or in other words the ‘tun (farm, homestead) of Thurweard’ which again postdates the Druids. The hamlet of Druid took its name from a late 18th century house name which again was well and truly after the time of the druids. This also applies to the nearby crossroads, mine, and plantations all of which have the ‘druid’ prefix. The Druid’s Stone is located in Wistman’s Wood and is more commonly known as the Buller Stone, The druid connotation has derived recently from letterboxing poetic licence insomuch as a couple of boxes were placed off of the fanciful ‘Druid Stone’. According to Crossing, “Not far from the Blackingstone is a pile of rocks bearing the name of the Druid’s Altar,” although he mentions the rocks he does not give any explanation as to why it was considered to be a druidical altar. The next misconception is the holed stones that were thought to have been hewn by the Druids and used in their rites and rituals. It is now known that these were naturally fashioned by erosional processes. They are caused by small, abrasive stones being swirled around a depression in the rock which gradually gouges out a hole. In the case of the Tolmen Stone this process continued until the hole had been bored right through the rock. Rock basins are another product of localised weathering and are formed when weak feldspar crystals are split by the frost along their cleavages. This loosens small fragments which are later blown away by the wind thus leaving a small hollow. The process continues and gradually the hollow expands outwards and downwards. Water fills the hollow and then freezes, upon thawing more fragments are eroded which once again are blown away by the wind. Over time the hollow widens and deepens and eventually a rock basin is formed. We then come to the idea that the many stone rows, menhirs, stone circles, and cairns were the work of the druids. This is now known to be false as the various relics would have been in-situ prior to the coming of the druids and date to the Bronze Age. The other point worth considering is that the Druids were so called ‘Celtic’ priests which is one of the most misleading terms, Celtic, when, who and where? This would more correctly date them to the Iron Age and so it is interesting to note the locations of known Iron Age hillforts and settlements on Dartmoor. Most of them occur on the edges of the moor and none of them are anywhere near any supposed druidical feature which seems strange. They use Epiphanies, and anyone can do it. Park your keister next to a Oak Tree. Then meditate. When you think you some figured out the answer to a life long mistery that’s the beginning. As sloon as you wonder how you did it the next unanswerable will be answered. After every mistry in your mind is answered you get the explanation. Yout Druid. The Earth Mother is responsable for this. It happened to me.